Everybody loves congratulating a newly wed couple. So here is a card I created to Congratulate some friends who tied the knot. I'd heard that there was a blue theme for the wedding, so I decided to use Very Vanilla and Pacific Point for my colour scheme. 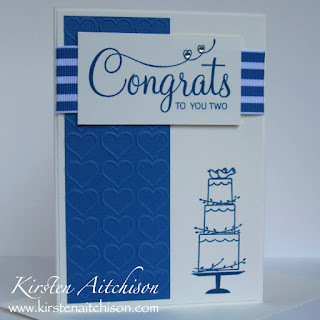 Using a my retired Your Perfect Day stamp set, Pacific Point ink and 2 pieces of Very Vanilla cardstock, I stamped the cake image from the set in the bottom right corner of the larger piece of cardstock and the Congrats sentiment on a smaller piece. I ran a piece of Pacific point cardstock through my Big Shot with the Happy Heart embossing folder. I trimmed the embossed cardstock to be 3 hearts wide by 10 hearts long. This was adhered with Snail adhesive to the larger Very Vanilla piece with the cake image. I then looked through my ribbon stash and found that my wide striped Pacific point ribbon worked best with the size of the sentiment piece. Unfortunately the ribbon has Whisper White instead of Very Vanilla, but I think it works well anyway (If I'd found my ribbon first I would have used Whisper White as my base instead). Using Snail I adhered the ribbon across the front of my cake & heart piece of cardstock with the ribbon edges tucked around the back. I then stuck the sentiment on top of the ribbon. I then adhered the card front to my Very Vanilla cardstock base. To add a little something extra, I used 2 small clear adhesive rhinestones in the middle of the hearts at the top of the sentiment. 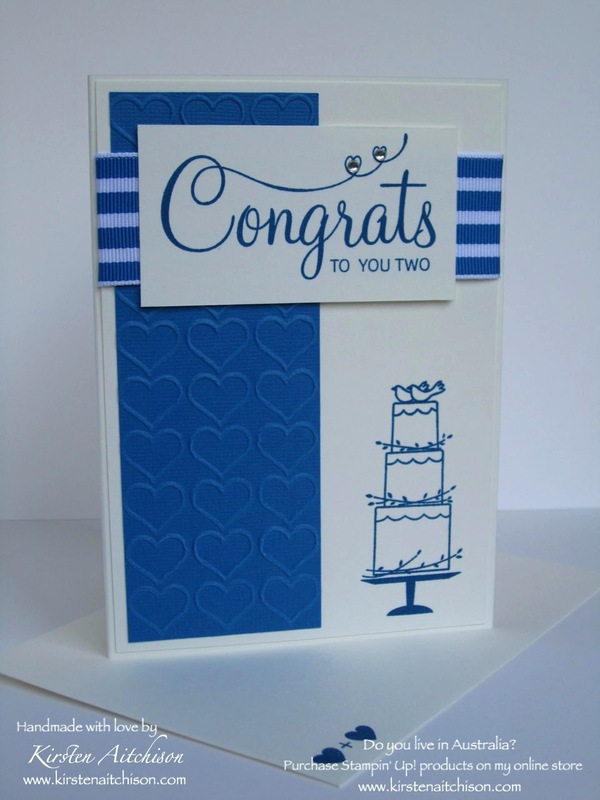 Our friends are a fun & relaxed couple and to add a little humour to the inside of the card, I used a super fun stamp from the retired It All Adds Up stamp set. To stamp the image in 2 colours, I used a small piece of a post-it note to cover up the heart, then stamped the image in Tuxedo Black ink. I then removed the piece of post-it note and coloured the heart using my Real Red Stampin' Write marker. 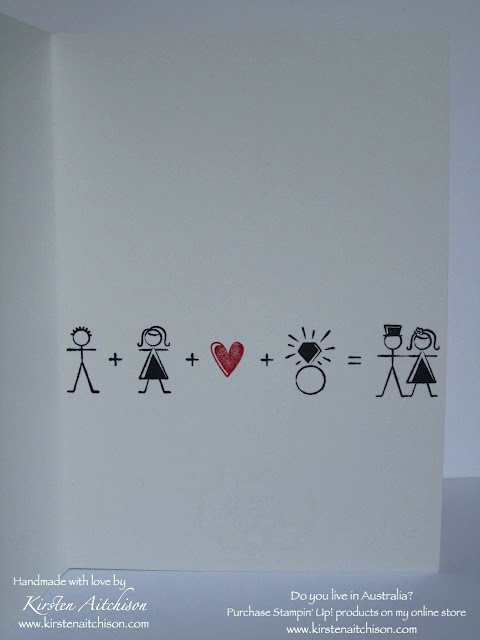 I really like the simplicity of the card, and it suited the laid back style of our friends while still being a beautiful card for such a special occasion. Thanks for stopping by and I hope you enjoyed my card. Such a lovely fresh colour palette Kirsten. Great design too! Thanks for joining us at Just Add Ink. This is a lovely personalised card, Kirsten. The wide striped ribbon looks really smart across the front of the card. 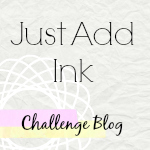 Thanks for joining in the fun at Just Add Ink this week! Thanks so much Christine :) The stripes definitely help finish off the card. Thanks so much Chantell :) I was really pleased with the layout I ended up with, it just worked so well. LOL! I love the inside! What a great wedding card. Thanks for sharing with us at Just Add Ink. Thanks so much Tina :) Definitely an awesome stamp, had to keep this set just for that stamp - it is so much fun.